This isn’t a statement you would expect to hear from a 12-year-old boy, and yet, for hundreds of youth in the Mantua section of West Philadelphia, this is exactly how they feel. In fact, many young people in Mantua report feeling abandoned after elementary school and left to fend for themselves at an extremely vulnerable age. Experiences that youth have during their non-school hours play a fundamental role in their development. Middle school students, especially in distressed neighborhoods, have a particular need for programs that will help them through these formative years. 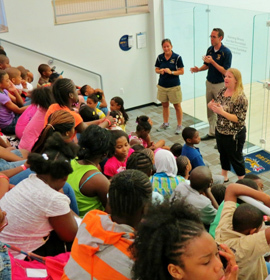 In the summer of 2012, Drexel partnered with community and city organizations – Philadelphia Parks & Recreation, Philadelphia Youth Sports Collaborative, We Are Mantua, Mantua Community Improvement Committee, DB4 youth task force and CustomED – to remedy this situation. The resulting program, called Mantua in Action, brings together sports and enrichment opportunities to help students develop athletic skills and academic abilities, benefit from peer and adult role models, and have a safe environment during after-school hours, all of which play key roles in in keeping youth in school and preventing their involvement in violent activity. About 140 Mantua middle school students are currently participating in the Mantua in Action after-school program, which operates each weekday from 3 – 6 p.m. at McMichael Morton School, James L. Wright Recreation Center and the Miles Mack Recreation Center in Mantua. 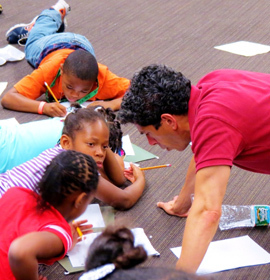 One part of Mantua in Action is the Mantua Theater Project’s “Playmaking” program, run by Drexel Theater Professor Nick Anselmo. 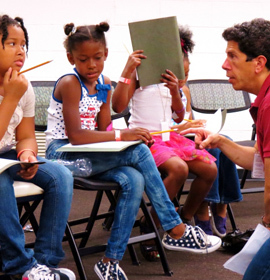 The program is an official replication of the New York’s 52nd Street Project and teaches students the basic tenets of playwriting and then pairs them with a professional playwright to write their own eight to ten page play. Once the plays are complete, professional directors and actors are hired for a full production. Last Saturday, March 9, the Project presented two performances of six plays written by 9- and 10-year-olds, called “The Super Power Plays,” in Drexel’s new URBN Center Annex Black Box Theater. Mantua in Action recently received a grant from the Aberdeen Charitable Foundation, which will provide funding for the next three years. For more information, visit DrexelNOW.